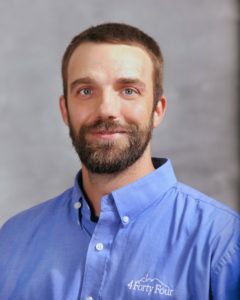 Ryan, who was born and raised in the foothills of North Carolina, received a great taste of mountain living and love for adventure as he was educated and graduated from Appalachian State University in 2005. His love of the mountains led him to Telluride, Colorado and Salt Lake City, UT where for the next seven years his entrepreneurial experiences were honed by working in many areas from hospitality management, masonry, xeriscaping as well as dabbling in mountain guiding and even dog mushing! After working in the administrative side of the resort industry Ryan immersed himself in many facets of the construction industry such as carpentry, decorative landscapes, aerial rigging, suspended structures, high ropes course development, ziplines, and many more. Once again, the mountains of North Carolina called. In 2012 Ryan married his beautiful wife, Nesha. They are proud parents of two handsome sons and a beautiful daughter. Ryan continues to follow and practice virtue in every aspect of his life and to bring the passion of spreading a holistic lifestyle to his circle of influence.